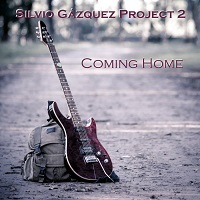 Fusion guitarist Silvio Gazquez presents his second album here for review. He calls his style Jazz/Rock fusion, and man oh man does he nail some beautiful moments here for your listening pleasure. The album contains ten tracks. Starting off with the groovy and funky “Summer Nights,” he opens with a fret burning before allowing the bass guitar to carry the melody during his time away from the spotlight. When he does join in, you can immediately hear his prowess on the instrument, but he prefers to let feeling into the conversation. If you ever wanted to hold onto summer, this is the song that will allow you to do so, especially during the interlude period past the second chorus, where his phrasing is just so perfect. “Breeze” opens lightly and spirited, and Silvio runs along that melody line like the captain of a ship roaring through a story sea, unscathed. “Coming Home” opens with a light and airy feeling, before the rhythm guitar and bass storm in and cover the bottom end. The mood is somber at times, and he lays down some wonderful axe-work throughout the song. “Mr. Jeremy” is a funky little number that features saxophone along with guitar and bass. Though it at times sounds like a “free-jam,” every note seems planned out and matches the melody line perfectly. Damian Righi definitely holds his own on the slapping of the four-string. Let the music in here, and it will take you to places you have only dreamed of. “Ice Beer” is an interesting title, for a song that slows down and breathes, with saxophone and guitar laying down legato notes that are easy to assimilate. The mood is satisfying and calm. “Flight Training” is heavier and a bit more aggressive out of the gate, but settles into a nice groove, with high flying guitars and keys. Just over half way in, Silvio lays down a guitar solo with plenty of pyrotechnics. “My Time” is slower and more thoughtful, with pensive saxophone notes leading the way. In favor of more aggressive axe-work, Silvio works well within the confines of the song by playing well-timed and attentive guitar leads. “Far Away” has that outer-world sound. While the bass guitar thumps away in a steady rhythm, the lead guitar endeavors to meet the music with a head on approach—no nonsense here. “See The Sky” is a pretty as the title suggests…gazing up at the approaching warm waves of sunshine piercing through grey skies. The meter is in 5/4 at times, and it makes for a very memorable experience. Silvio continues to construct solos that are playful with the main melody lines, yet hug them so close. “Julieta” closes the album, with a friendly opening keyboard melody that is soon joined by guitar work where the rhythm is as important as the leads. Just a little foot on the gas is enough to pull you in and wrap you around the synergy that is presented here in all of the instruments working together. There is a long keyboard melody which wraps up the sound at the end, fading out. What makes the album so special, besides the absolutely spectacular guitar work, is the balance Silvio achieves with all of the instrumentation. When he lets go, look out. His fingers are all over the fretboard in an emotional display of prowess that is as good as anything you have heard from instrumental guitar lately. When he lays back, it is just as magical, because the other instruments take center stage in a flurry of Jazz and Rock rhythms that tantalize your every need when it comes to instrumental guitar albums. Definitely give this your time!